"Zirconia" redirects here. For the mineral, see Zircon. 2), sometimes known as zirconia (not to be confused with zircon), is a white crystalline oxide of zirconium. Its most naturally occurring form, with a monoclinic crystalline structure, is the mineral baddeleyite. 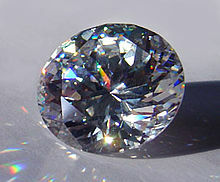 A dopant stabilized cubic structured zirconia, cubic zirconia, is synthesized in various colours for use as a gemstone and a diamond simulant. Zirconia is produced by calcining zirconium compounds, exploiting its high thermal stability. Three phases are known: monoclinic below 1170 °C, tetragonal between 1170 °C and 2370 °C, and cubic above 2370 °C. The trend is for higher symmetry at higher temperatures, as is usually the case. A small percentage of the oxides of calcium or yttrium stabilize in the cubic phase. The very rare mineral tazheranite (Zr,Ti,Ca)O2 is cubic. Unlike TiO2, which features six-coordinate Ti in all phases, monoclinic zirconia consists of seven-coordinate zirconium centres. This difference is attributed to the larger size of Zr atom relative to the Ti atom. Zirconia is chemically unreactive. It is slowly attacked by concentrated hydrofluoric acid and sulfuric acid. When heated with carbon, it converts to zirconium carbide. When heated with carbon in the presence of chlorine, it converts to zirconium tetrachloride. This conversion is the basis for the purification of zirconium metal and is analogous to the Kroll process. Zirconium dioxide is one of the most studied ceramic materials. ZrO2 adopts a monoclinic crystal structure at room temperature and transitions to tetragonal and cubic at higher temperatures. The change of volume caused by the structure transitions from tetragonal to monoclinic to cubic induces large stresses, causing it to crack upon cooling from high temperatures. When the zirconia is blended with some other oxides, the tetragonal and/or cubic phases are stabilized. Effective dopants include magnesium oxide (MgO), yttrium oxide (Y2O3, yttria), calcium oxide (CaO), and cerium(III) oxide (Ce2O3). Zirconia is often more useful in its phase 'stabilized' state. Upon heating, zirconia undergoes disruptive phase changes. By adding small percentages of yttria, these phase changes are eliminated, and the resulting material has superior thermal, mechanical, and electrical properties. In some cases, the tetragonal phase can be metastable. If sufficient quantities of the metastable tetragonal phase is present, then an applied stress, magnified by the stress concentration at a crack tip, can cause the tetragonal phase to convert to monoclinic, with the associated volume expansion. This phase transformation can then put the crack into compression, retarding its growth, and enhancing the fracture toughness. This mechanism is known as transformation toughening, and significantly extends the reliability and lifetime of products made with stabilized zirconia. The ZrO2 band gap is dependent on the phase (cubic, tetragonal, monoclinic, or amorphous) and preparation methods, with typical estimates from 5–7 eV. A special case of zirconia is that of tetragonal zirconia polycrystal, or TZP, which is indicative of polycrystalline zirconia composed of only the metastable tetragonal phase. The main use of zirconia is in the production of hard ceramics, such as in dentistry (see below), with other uses including as a protective coating on particles of titanium dioxide pigments, as a refractory material, in insulation, abrasives and enamels. Stabilized zirconia is used in oxygen sensors and fuel cell membranes because it has the ability to allow oxygen ions to move freely through the crystal structure at high temperatures. This high ionic conductivity (and a low electronic conductivity) makes it one of the most useful electroceramics. Zirconium dioxide is also used as the solid electrolyte in electrochromic devices. Zirconia is a precursor to the electroceramic lead zirconate titanate (PZT), which is a high-K dielectric, which is found in myriad components. The very low thermal conductivity of cubic phase of zirconia also has led to its use as a thermal barrier coating, or TBC, in jet and diesel engines to allow operation at higher temperatures. Thermodynamically, the higher the operation temperature of an engine, the greater the possible efficiency. Another low thermal conductivity use is a ceramic fiber insulation for crystal growth furnaces, fuel cell stack insulation and infrared heating systems. This material is also used in dentistry in the manufacture of 1) subframes for the construction of dental restorations such as crowns and bridges, which are then veneered with a conventional feldspathic porcelain for aesthetic reasons, or of 2) strong, extremely durable dental prostheses constructed entirely from monolithic zirconia, with limited but constantly improving aesthetics. Zirconia stabilized with yttria (yttrium oxide), known as yttria-stabilized zirconia, can be used as a strong base material in some full ceramic crown restorations. Transformation toughened zirconia is used to make ceramic knives. Because of the hardness, ceramic-edged cutlery stays sharp longer than steel edged products. Due to its infusibility and brilliant luminosity when incandescent, it was used as an ingredient of sticks for limelight. Zirconia has been proposed to electrolyze carbon monoxide and oxygen from the atmosphere of Mars to provide both fuel and oxidizer that could be used as a store of chemical energy for use with surface transportation on Mars. Carbon monoxide/oxygen engines have been suggested for early surface transportation use as both carbon monoxide and oxygen can be straightforwardly produced by zirconia electrolysis without requiring use of any of the Martian water resources to obtain hydrogen, which would be needed for the production of methane or any hydrogen-based fuels. Zirconia is also a potential high-k dielectric material with potential applications as an insulator in transistors. Zirconia is also employed in the deposition of optical coatings; it is a high-index material usable from the near-UV to the mid-IR, due to its low absorption in this spectral region. In such applications, it is typically deposited by PVD. In jewelry making, some watch cases are advertised as being "black zirconium oxide". In 2015 Omega released a fully ZrO2 watch named "The Dark Side of The Moon"  with ceramic case, bezel, pushers and clasp, advertising it as four times harder than stainless steel and therefore much more resistant to scratches during everyday use. Single crystals of the cubic phase of zirconia are commonly used as diamond simulant in jewellery. Like diamond, cubic zirconia has a cubic crystal structure and a high index of refraction. Visually discerning a good quality cubic zirconia gem from a diamond is difficult, and most jewellers will have a thermal conductivity tester to identify cubic zirconia by its low thermal conductivity (diamond is a very good thermal conductor). This state of zirconia is commonly called cubic zirconia, CZ, or zircon by jewellers, but the last name is not chemically accurate. Zircon is actually the mineral name for naturally occurring zirconium silicate (ZrSiO4). ^ Platt, P.; Frankel, P.; Gass, M.; Howells, R.; Preuss, M. (November 2014). "Finite element analysis of the tetragonal to monoclinic phase transformation during oxidation of zirconium alloys". Journal of Nuclear Materials. 454 (1–3): 290–297. doi:10.1016/j.jnucmat.2014.08.020. ^ Chang, Jane P.; You-Sheng Lin; Karen Chu (2001). "Rapid thermal chemical vapor deposition of zirconium oxide for metal-oxide-semiconductor field effect transistor application". Journal of Vacuum Science and Technology B. 19 (5…): 1782–1787. doi:10.1116/1.1396639. ^ Gambogi, Joseph. "USGS Minerals Information: Zirconium and Hafnium". minerals.usgs.gov. Archived from the original on 18 February 2018. Retrieved 5 May 2018. ^ "Thermal-barrier coatings for more efficient gas-turbine engines". studylib.net. Retrieved 2018-08-06. ^ Papaspyridakos, Panos; Kunal Lal (2008). "Complete arch implant rehabilitation using subtractive rapid prototyping and porcelain fused to zirconia prosthesis: A clinical report". The Journal of Prosthetic Dentistry. 100 (3): 165–172. doi:10.1016/S0022-3913(08)00110-8. PMID 18762028. ^ "Best Ceramic Knives, Cutlery, & Kitchenware - Kyocera Knives". kyoceraadvancedceramics.com. Archived from the original on 21 December 2012. Retrieved 5 May 2018. ^ Landis (2001). "Mars Rocket Vehicle Using In Situ Propellants". Journal of Spacecraft and Rockets. 38 (5): 730–35. doi:10.2514/2.3739. ^ "Omega Co-Axial Chronograph 44.25 mm". OMEGA Watches. Archived from the original on 2016-03-26. Retrieved 2016-03-27. ^ "Speedmaster Moonwatch Dark Side Of The Moon | OMEGA®". Omega. Archived from the original on 2018-02-09. Retrieved 2018-02-08. Green, D. J.; Hannink, R.; Swain, M. V. (1989). Transformation Toughening of Ceramics. Boca Raton: CRC Press. ISBN 0-8493-6594-5. Heuer, A.H.; Hobbs, L.W., eds. (1981). Science and Technology of Zirconia. Advances in Ceramics. 3. Columbus, OH: American Ceramic Society. p. 475. Claussen, N.; Rühle, M.; Heuer, A.H., eds. (1984). Proc. 2nd Int'l Conf. on Science and Technology of Zirconia. Advances in Ceramics. 11. Columbus, OH: American Ceramic Society. This page was last edited on 31 October 2018, at 19:50 (UTC).